It's my pleasure to welcome speculative fiction author James McCormick to my blog today. He is also giving one reader the chance to win a pdf copy of Dragon. Comment to win a pdf copy of the book. All you need to do is comment in the box below and one winner will be randomly selected. DL: Hi James. Firstly, can you tell us a bit about yourself. James: I’m a college lecturer from the rainy city of Manchester, England and have been writing speculative fiction for over a decade and a half, mostly science fiction, horror and a little fantasy. For me writing is all about escapism and imagination, the further a tale is from reality the more I enjoy it. Mostly I write short stories and novellas and have been fortunate enough to have had many of these published professionally. I also write short novels (40 000 to 60 000 words). My first science fiction novel and my ‘baby’ is called Dragon. I wrote the first draft of it ten or so years ago and since then it steadily evolved into the version published in October 2013 by Class Act Books. I’ve had three other works published since then with one more (another Dragon novel) to come out in November of this year. DL: Can you give us some background to the novel. 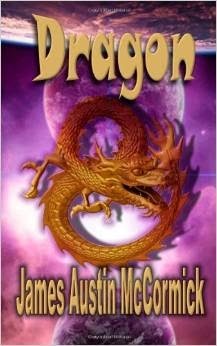 James: Dragon grew out of two ill matched protagonists who'd been in my mind for a long time. One was a restless, reckless and neurotic elf and the other a taciturn, ill- tempered barbarian, think Conan without the brains or charm. Originally I planned to write a series of interlinking fantasy novellas following their adventures together. The tone was to be comedic and I intended them to be a sort of comedy double act, the elf the clownish figure and the barbarian the straight man, the foil as it were. Well, the characters developed a life of their own and survived, as did the interlinking format to follow their adventures but somehow the story seemed to work better with a science fiction spin. Because of this transition from fantasy to science fiction the novel took about a decade to fully evolve into its present manifestation. It does retain a strong fantasy element though and the two protagonists still travel around by Dragon, although a metallic one instead of the reptilian creature that existed in the original conception. The final chapter "Relics" blurs the lines completely between the world of magic and gods and science as an ancient mystery is finally answered. Although it would be next to impossible to write an actual sequel the twenty year time span the novel occupies allows me a lot of scope to write further tales around the same characters. I have a second novel, Dragon: Smuggler Tales coming out in November, a series of connected stories that take place in the year that elapses between chapters one and two of Dragon. Dragon is an epic, action packed tale of adventure set amongst the political backdrop of an uneasy intergalactic cease fire. As worlds conspire against each other, Gax, an insane warlord stockpiles an arsenal of ancient technology in his attempt to rule known space. Two ill matched and reluctant heroes stand in his way; Sillow, a neurotic and cowardly Sylvan and Brok, a surly and ill tempered Herkulun warrior. After a chance meeting in a seedy, mobster owned casino the two find their fates interlinked as they are propelled into a series of hair raising adventures that takes them from wanted smugglers to agents of a peace keeping alliance. As war grows close once again Sillow and Brok realize it is they alone who must stop Gax and prevent Armageddon, a very tall order indeed for two unlikely heroes. Asmara was a small desert moon orbiting its gas giant parent at a distance just great enough to put it outside the planet’s radioactive reach. It was a cold, dusty little place, barely capable of supporting microbic life. Yet it did have one thing in its favor, its location. Asmara was in the gray zone, an area of space almost central to the six worlds. None dared lay claim to it and consequently it was free of all outside authority. That was why the crime syndicates built their Pleasure Dome there, and in the two decades after the Dark Age Wars it flourished. It was here, at one of the casino tables, the last three players of a merciless card game studied their hands. Two of them, a human and a reptilian Tuolon, were far from happy, glaring angrily at the third player as he whistled out a tuneless melody. If Sillow had been human, he would have been judged to be no more than fourteen. He wasn’t; he was a Sylvan, and his childlike face and adolescent build were quite normal for his twenty-five years. As he looked over his cards from beneath a shock of dark green hair, only his large eyes were visible. It was just as well, for his lips moved frantically as he mentally played through the possible scenarios. He looked at his cards again, studying them as he blew smoke rings in the air. His little feet tapped all the while on the hard marble floor. His fellow players regarded him with extreme irritation, and the human came to the decision the Sylvan was playing mind games with them. The truth though was far different. Sillow was scared and was trying to decide how best to safely extricate himself and the credits he needed from his present circumstances. Although he couldn’t say why, he was certain now the Tuolon was a professional assassin here to kill him. His would be killer even blew his ship up to stop him escaping. Since then the little Sylvan had been busy at the tables making the money he needed to get a freighter off the Dome. There was a royal summons to answer and he’d delayed too long already. The message was just one word, Suleiman. The human thought hard for a moment, shook his head then threw the chips into the pot in the middle of the table. Sillow turned to the Tuolon. “What about you, En’n?” he asked, knowing his reptilian companion was more than out of his depth. The leathery area around the Tuolon’s eyes tightened and he opened his canine like jaws to reply. His physiology prevented him from forming Amalgam words, the common language used between the races. Instead he was forced to rely on the electronic collar at his neck. Sillow shook his head. “Sorry. You know the rules. You fold, you leave.” He waved his cigar towards the exit. “Can’t do that,” Sillow told him. The Tuolon’s anger was growing, Sillow realized; now was the moment to push him past his limited self-restraint. The human gasped, pushing his chair away from the table. The Tuolon got to his feet, his powerful frame shaking with fury. “I will kill you,” he hissed. Sillow felt his heart beating like a jack hammer. He was ready to bolt at the reptile’s slightest move. A faint hum of a sentinel though told him his plan was working. The spherical droid appeared above them. Sensors flashed as it monitored everything in its immediate environment, heart rate, respiration, hormonal skin level. Its three red optics trained on the Tuolon. The reptile stared up at the black sphere. “Not correct,” he answered, nostrils flaring. “No threat.” His chest heaved as he answered. “No threat here,” Sillow added, reaching over and giving the assassin a pat on the arm. With a huge effort the Tuolon sat down. “Play,” he replied. Sillow looked the reptile over. “What can you bet with?” he asked. He leaned back, tapping a finger on his cheek. “You’re almost out credits. How about jewelry?” He looked at En’n’s simple animal hide armor, “no.” He frowned, then snapped his fingers. “I know,” he announced, pretending the idea had just come to him, “your ship.” The Tuolon gave a start. “Do you agree to this wager?” the Sentinel asked in its emotionless voice. Sillow watched En’n’s discomfort with satisfaction. The Tuolon, he knew, could not afford to lose his ship, but he could also not afford to let his prey out of his sight either. It was, after all, frustration with his elusive quarry which forced him to the card table in the first place. The man sighed. “Guess so,” he replied. There was a pause, small lights flashing as the sentinel conveyed the message. The man gave a shrug of his bony shoulders. “What the hell,” he groaned. He threw his cards down, four of a kind. The Tuolon gave a soft grunt then threw down a superior straight. The man let out a despairing cry and slumped back in his chair. Sillow’s childlike face was unreadable. He shrugged and scratched his cheek in an absent minded way as he regarded the cards in front of him. “Oh, well,”he said after some moments, “guess that makes me the winner.” He flashed his reptilian opponent a smile then laid down a royal flush. En’n froze, unblinking. His chest rose and fell dangerously, and his fists clenched so tightly his claws cut into his palms. The sentinel, Sillow knew, would be monitoring all this. It was time to push his adversary over the edge. He took a long draw on his cigar and blew a stream of smoke in his direction. “Bad luck, En’n, and so long,” he said scooping the pile of credits towards him. He put them into the leather pouch around his waist. “How do you say it in Tuolon? Ah, yes…” he finished putting the last of the credits away and leaned forward. “Ekarak,” he hissed in a bad imitation of the warrior farewell. To the cold logic of the sentinel there was nothing provocative in these words, but Sillow knew such familiar language from one not of the Tuolon warrior caste would infuriate the reptile. The assassin roared in fury and, forgetting all other considerations, swung at the Sylvan’s throat with his lethal claws. Sillow, however, with the quick reflexes of his race, backed out of range. En’n, his attempt frustrated, plunged into a berserker rage and began to swing out wildly in all directions. Sillow. Before he could close the distance though, the sentinel fired an energy bolt, sending the reptile crashing unconscious to the floor. Sillow needed no prompting. He was about to leave when he caught the haunted, despairing expression on Garrick’s face. He reached into his pouch and pulled out a handful of credits, far more than the man was able to count. The man, still flat on his back, managed a small nod. The Tuolon ship was a sleek craft, built like a needle with a power core capable of great speed. He could make it to Sylvan in less than a day in this thing. There were, however, two big problems. The first was a good, working knowledge of the Tuolon language was necessary to operate the complex controls, as opposed to the few phrases he knew. The second was it was a two man ship, possibly three. There was no way he could pilot this thing alone. Sillow gave a soft curse as he ran the problem through his mercurial mind. He brought a small fist down on the control panel in frustration. He had no choice but to hawk it at a low enough price to make a quick sale. Doing so, however, would mean more delay and danger too. The assassin En’n might be safely locked up, but whoever he was working with wasn’t. Decision made, he rushed out of the craft and headed off in the direction of the barter quarters. The portcullis like doors opened automatically and Sillow rushed through. Two Tuolons were waiting for him. Smaller in stature than En’n and clearly not the fearsome killer their master was, they were nevertheless a frightening sight, especially for the diminutive Sylvan. The doors slammed shut behind him. Sillow realized it was all over if he did. What could he do? He’d never learned to fight and had no idea how to use the compact staff he carried on his belt. Even if he did, he seriously doubted he could have taken these two on anyway. His only advantage was his speed, but to make it work he needed to get some space between them and him. A warning siren sounded in response to his cry. The Tuolons panicked. One reached out to grab him, lunging forward. Sillow timed his move carefully. He jumped up onto his larger opponent’s outstretched leg and somersaulted over him. The Tuolons turned and raced after him but soon realized keeping up with their quarry amongst the labyrinthine corridors would be no easy matter. Sillow never slowed, even as he heard his pursuers’ footsteps growing fainter behind him. Eventually though, curiosity overcame terror and he chanced a look behind him. He should have looked ahead for it was then he ran into the wall. Thank you James for dropping by. Keep in touch about the second book. VaporFi is the highest quality electronic cigarettes provider on the market.